Australia’s wine regions offer guaranteed relaxing breaks thanks to scenic drives, gorgeous rural vistas, endless rows of romantically gnarled grapevines, and increasingly exceptional on-site restaurants. Alissa Jenkins finds the most delightful accommodation nestled among the vines, so you can stay where you play. Although this estate no longer encompasses a vineyard – it was subdivided from the winery (now named Yering Station) 15 years ago – this luxurious five-star property remains an icon of the Yarra Valley. Founded in 1838 by the Ryrie brothers, it was here the brothers planted vine cuttings that grew Victoria’s first vintage. Chateau Yering Historic House Hotel has been part of the prestigious Relais & Chateaux association since 2001. A heritage-listed Victorian mansion, Chateau Yering comprises 32 suites, each decorated with individual colour schemes and antique furnishings. All have a marble ensuite and private balcony. There’s 24-hour room service and guests have access to the Chateau’s pool, tennis court and cocktail bar. Suites may have a king-size, antique half-tester or four-poster bed, claw-foot or spa bath with separate shower and a gas or open log fireplace. From $825 per couple for dinner, bed and breakfast. Winter rate from $495 per couple, available until September 30. Situated on 25 acres of rolling Hunter Valley landscape, five-star Spicers Vineyards Estate looks across its own private vineyard towards the imposing Brokenback Range. Later this year the estate will open Spa Anise, which will have single and double treatment rooms and a range of unique treatment options. In the meantime, guests will just have to make do with an optional in-suite massage. Nestled between rows of vines and natural bushland, the eight spacious suites here are kitted out with all sorts of goodies to ensure guests can unwind and rejuvenate – such as local bubbles, fluffy robes and slippers and L’Occitane bathroom products. But so much relaxing and wine sampling can really give you an appetite, so the estate’s Restaurant Botanica comes in handy. From $340 per suite per night midweek, or from $445 per suite per night over the weekend. An hour’s drive from Melbourne in the heart of the picturesque Mornington Peninsula is this European-inspired retreat, with 30 acres of gardens, lawns and its own vineyard. The cellar door has an extensive range of wines, including those produced at Lindenderry and at sister vineyards in the King Valley and Macedon Ranges. Part of the privately owned Lancemore hotel group, Lindenderry has 40 individually decorated rooms, all with views of the stunning surrounding landscape. Each room features a flat-screen TV, wi-fi, a king or queen bed and other little luxuries such as daily newspaper delivery. Premium rooms also have a spa bath and open fireplace. 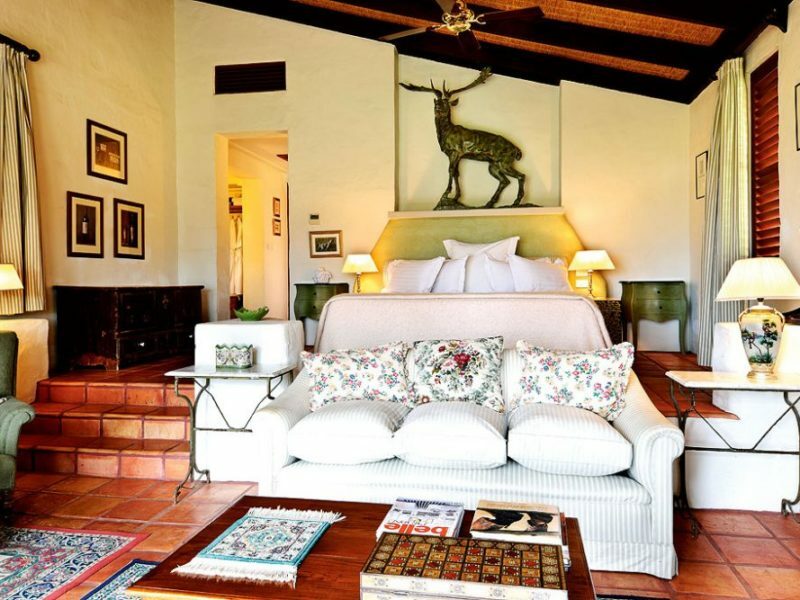 Throughout the property you’ll find an eclectic collection of artworks and antiques. On-site facilities include a Wellness Centre, featuring a hot spa and pool. From $280 per night per couple, packages available. The natural world meets modern design at the family-owned Port Phillip Estate, also located at Red Hill on the beautiful Mornington Peninsula. Emerging dramatically from the native landscape and vineyard, this modernist structure houses the cellar door, winery and accommodation. The estate incorporates environmental initiatives such as architectural features that shield interior spaces from the afternoon sun, avoiding fluctuations in temperature that would otherwise need heating and cooling. Six exclusive luxury apartments opened on the estate last year and all feature king-size beds with leather headboards, spacious ensuites, plush Missoni bathrobes, glamorous furnishings and outdoor terraces with stunning views across the vines to the bay. With a discreet guest-only entry and car parking, privacy is paramount. First planted in 1958, Moorilla Estate vineyard has seen a lot of changes, with the property now home to the Museum of Old and New Art, The Source Restaurant, Moo Brew brewery and eight free-standing luxury MONA pavilions. The contemporary villas sit on a private peninsula 15 minutes from Hobart, with views across the Derwent River. Four of the MONA pavilions are named after influential Australian architects such as Esmond (Dorney) and Walter (Burley Griffin); the remaining four are named after major Australian artists including Arthur (Boyd) and Brett (Whiteley). Bold and elegant in design, the pavilions feature a 24-hour concierge, spa baths, king-size beds with 400-thread-count linen, wine cellars, underfloor-heated bathrooms, iPod docks and a wide variety of music online, as well as original artworks from the MONA collection. Guests also have access to a heated infinity lap pool, sauna and gym. Central to the Barossa Valley and an hour from Adelaide, The Louise vineyard retreat is at the pinnacle of luxury wine stays in Australia. Together with the vineyard’s award-winning Appellation restaurant, The Louise is a member of several noteworthy groups such as Relais & Chateaux and Luxury Lodges of Australia, reflecting its strong reputation in the industry both locally and overseas. Featuring 15 luxurious suites, The Louise promises guests complete privacy and stunning views of surrounding vineyards from each suite’s gated courtyard and rear terrace. Also expect a king bed fitted with luxury linen, precise lighting control, widescreen television, ensuite bathroom with spa tub, rain shower for two, heated towel rails and dual vanity basins, as well as complimentary high-speed broadband and wireless internet. From $429 per couple per weeknight; $479 per night on weekends. Moorooroo Park Gardens sits on the banks of Jacobs Creek in the Barossa Valley. French-inspired rose gardens, olive groves, orchards and shiraz vineyards make the Park a scenic and tranquil base from which to explore surrounding wineries. A stone homestead dating back to the 1840s has been transformed into seven luxury suites. Surrounded by gardens, all suites are uniquely designed with beautiful European finishes and offer a king bed with luxurious linen, shower and spa, flat-screen television and minibar. From $340 per couple per night, breakfast included. Just outside the historic township of Macclesfield in the Adelaide Hills lies this 200-acre estate comprsing a vineyard, Heritage-listed homestead and freestanding private apartments. The family-run winery is now in its tenth year and grows both white and red varietals, producing a range of wines such as cabernet sauvignon, shiraz, nebbiolo, sauvignon blanc, riesling and chardonnay. The main rooms are in a restored homestead dating back to the property’s original dairy days, which can be booked as one large or two private apartments. Featuring king and queen bedrooms, two newly renovated spa bathrooms, full kitchen and second kitchenette, modern entertainment system, private balconies and a large sunroom, this air-conditioned home sleeps up to 10 guests. Alternatively, guests can stay in Longview’s Yakka or Riesling apartments, overlooking the property’s Iron Knob riesling vineyard. Each has a king-size bed, flat-screen TV, self-contained kitchenette, ensuite bathroom, ducted air conditioning and wood-fire heating, as well as a private balcony. From $180 per couple per night. Featuring 22 suites and a five-bedroom private residence, each suite comes with views of the lush surrounding landscape, king or twin beds, LCD television and DVD player, ensuite bathroom and complimentary wi-fi, while guests are welcome to use the on-site all-weather tennis court and swimming pool. Superior rooms also have a spa bath, spacious lounge area and optional private cooking classes. Tower Estate, Pokolbin, is in the heart of NSW’s Hunter Valley region. Comprising an award-winning combination of Tower Lodge, Tower Estate Winery and underground fine-dining restaurant Nine, the estate is among the world’s best. It is also a member of the exclusive top-end hotel and restaurant group, Relais & Chateaux. Truly five-star, Tower Lodge accommodates a maximum of 24 people within its low-rise Spanish mission-style architecture. There are 12 indulgent guestrooms to choose from, library, meeting room, bar and lounge, and a number of impressive recreational facilities for guests to use. Among them is The Dinks; an 18-hole pitch-and-putt golf course, a 1.6km walking track, heated pool, sauna, gym and massage treatment room. There are also plans to expand Tower Lodge over the next four years to encompass 12 new villa-style rooms. From $720 per couple per night.